Strength, dignity, wisdom and courage can be seen in this older Native American. 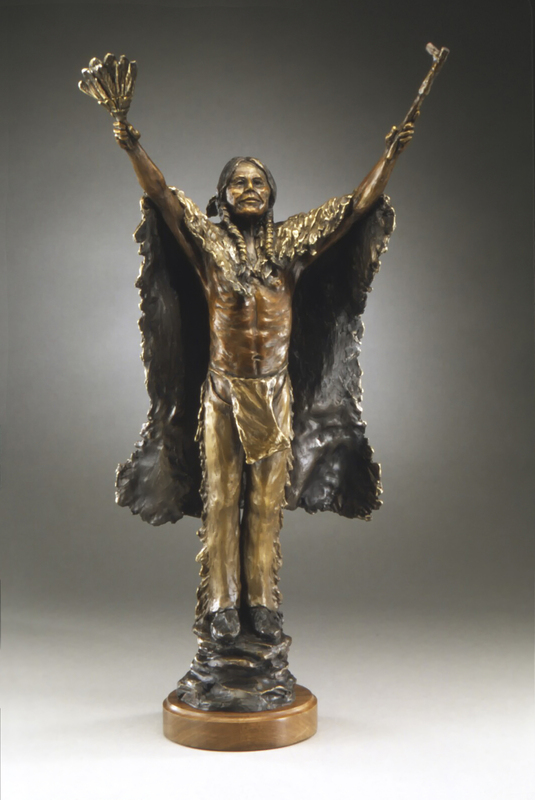 Depicted in this statue is an older, wiser Native American with uplifted spirit, head and arms. He shows dignity and pride. His bare chest, robed with a buffalo hide, symbolizes great endurance. The robe also lends to the sense of his personage throughout the generations of his people. Both the relationship of the Native American to the Great Spirit and his relationship to mankind are symbolically depicted. His uplifted right hand holds out a prayer fan very commonly used throughout all tribes. The birds whose feathers make up the prayer fan are thought to carry the prayers of the people to the Creator. The uplifted left hand holds a calumet, or peace pipe, symbolic of the man-to-mankind relationship. The calumet is commonly used ceremonially and to seal agreements.. This sculpture as a maquette was a finalist in the competition for a monument to be placed atop of Oklahoma's State Capitol dome. A casting of this size is inside of the Oklahoma State Capitol, installed in 2014..